Thoracic mobility is a key component of spinal rotation. Thoracic mobility has become a buzzword over the last several years. This is likely due to the constant barrage of messages dealing with functional movement and mobility versus stability, along with the increased popularity of many movement-based therapies, such as yoga. While many buzzwords come and go, thoracic mobility is something that is, hopefully, here to stay as it is an imperative part of human movement. 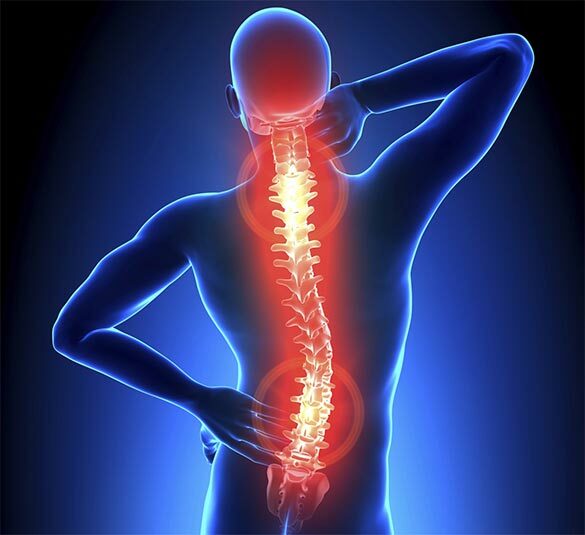 Furthermore, those that lack mobility through the thoracic spine are subject to more injuries involving the shoulder and neck, as well as having an increased prevalence of low back pain. Here we will introduce the thoracic spine and why movement in this region is so important. Also, we’ll investigate how to assess thoracic spine motion and cover a variety of modalities, such as SMR, stretching, and strengthening exercises to best improve how you move through the thoracic spine. The thoracic spine is the twelve vertebrae of the middle segment of the vertebral column. While all vertebrae have rib components, they are usually small and make up the transverse processes in regions other than the thorax (Drake, Vogl & Mitchell, 2015). In the thorax, the ribs articulate with each vertebra, at the vertebral bodies and transverse processes. A typical thoracic vertebra has two partial surfaces on each side of the vertebral body for articulation with the head of its rib and the head of the rib below. Each transverse process also has a smooth, flat surface for articulation with the connection of its rib. Thoracic vertebrae 2-9 share the same characteristics whereas, thoracic vertebra 1 and 10-12 are different. The first thoracic vertebrae have the body that resembles a cervical vertebra. Thus, the first thoracic vertebrae usually have very similar movement characteristics of the cervical vertebrae. The ninth thoracic vertebra is lower and thicker than the vertebrae above. From here, thoracic vertebrae 10-12 begin to thicken and resemble that of the lumbar spine. In many cases, the last two to three thoracic vertebrae begin to demonstrate movement characteristics of the lumbar spine. On average, each thoracic vertebra can rotate approximately 3°. Therefore, the entire thoracic spine should demonstrate between 30-35° of total rotation to each side (Neumann, 2010). It is commonly thought that the lumbar vertebrae should not rotate. However, the lumbar spine also rotates, albeit less than the thoracic. The lumbar vertebrae demonstrate approximately 2° of rotation between each, resulting in 10° of rotation to each side. Thus, the total thoracolumbar rotation should be approximately 45° in each direction. What should be considered here, however, is the consequences to the lumbar spine if the thoracic spine does not rotate well enough. If the thoracic spine does not rotate, the lumbar spine is forced to rotate more, which could play a role in low back pain or injury. As Bogduk (2005) describes, rotation of more than 3° at any lumbar segment could damage the articular surface and tear collagen fibers that make up the disc between each vertebra. The angles of the joints in the thoracic spine allow for motion in all planes: rotation, flexion/extension, and lateral flexion. However, the ribs block excessive lateral flexion from occurring. Sagittal plane flexion and extension is also available in the region of the thoracic spine. Neumann (2010) states that the normal adult demonstrates 40° to 45° of natural kyphosis (Figure 1) while standing. From neutral, the thoracic spine can flex to approximately 35° of additional flexion. Thus, in full flexion, the thoracic spine demonstrates up to 75° of flexion. Conversely, the thoracic spine only moves 20° to 25° of extension. Therefore, if the normal position is 40°, the fully extended is still 15-20° of flexion. When the term “extension” is used about the thoracic spine, the meaning is a reduction in relative flexion. While there may not be true extension of the thoracic spine, this reduction in flexion is important for movement of the scapula and arm. To move the arm into full shoulder flexion requires the thoracic spine to move into extension. During flexion, the scapula upwardly rotates and posteriorly tilts on the rib cage, which encourages thoracic extension. Therefore, if the thoracic spine cannot extend, the scapula cannot posteriorly tilt, and the glenohumeral joint cannot get to full flexion, which increases the risk of shoulder impingement (Figure 2). Many muscles influence the movement of the thoracic spine, but the most notable are the spinal erectors, rhomboids, and middle trapezius. While these muscles have important functions, they are rarely mechanically shortened and overactive. Thus, the goal of improving thoracic motion is not to “release and lengthen” these muscles. However, foam rolling the thoracic spine is incredibly valuable to mobilize the vertebrae themselves specifically. Muscles that play a role in thoracic spine motion that typically are short and tight are the pectorals and the latissimus dorsi. These are the muscles that usually need foam rolling and static stretching if a movement assessment indicates they are mechanically short. Use the overhead squat assessment to begin testing movement in the thoracic spine. View the client from the side to quickly screen the thoracic spine. The client should be able to get the arms to full flexion (180°) (Figure 3) while keeping the pelvis and lumbar spine neutral. If the client is unable to maintain the arms overhead, or unable to get them there, then move on to more detailed assessments. Two additional assessments with help dig deeper into the complex nature of the thoracic spine. First, will be a supine flexion assessment followed by a thoracic rotation assessment. The flexion assessment will test the ability of the client to lengthen the muscles that attach to the shoulder along with extension capabilities of the thoracic spine. When the client is lying supine, the body does not require any stabilization. Thus muscles can relax and move better. Therefore, this assessment gives a truer indication of muscle length. The second assessment will identify whether there is a rotation restriction. Rotation through the thoracic spine facilitates both stability of the cervical spine and cranium along with optimal function of the lumbar spine. Since thoracic rotation is so important, a rotation deficit may contribute to a lack of extension and impede shoulder movement during functional actives such as running, throwing, and swimming. Have clients lay supine with legs together and hip and knees bent, so the feet are flat on the floor. This position will shorten the hip flexors, ensuring they are not contributing the compensation and place the pelvis in a neutral or slightly posteriorly tilted position. Next, have the client reach both arms out to 90° of shoulder flexion with elbows locked out. Then, while keeping elbows extended, try to flex the shoulders until the arms are completely overhead (Figure 4). The client should be able to get the arms near the floor (between 160° and 180° of shoulder flexion) while keeping the lumbar spine neutral. Arms will not reach the floor with elbows extended. Bottom of ribcage will elevate—many clients will “force” their arms to the ground simply because you told them to reach the ground. Have client get into a quadruped position, on hands and knees. As was mentioned previously, total rotation in the thoracic and lumbar regions should be 45° in each direction. However, from an assessment standpoint, one should attempt to isolate rotation to the thoracic spine. To do this, have the client sit the hips on to the heels and place forearms on the ground, thus pulling the supraspinous ligament taut preventing lumbar rotation. As Johnson, Kim, Yu, Saliba, and Grindstaff (2012) found, this was a reliable position for measuring thoracic rotation. From here, the client places one hand behind the head and attempts to rotate just the thoracic spine in the direction of that hand (Figure 5). Repeat on other side. The client should demonstrate approximately 35° of rotation in each direction from this position. It is not necessary to use a specialized tool to measure this as one can come close enough using a visual assessment. Picture a 45° angle, and the client should get close to this. Also, symmetry is imperative through the spine. So, pay attention to whether the client can rotate the same amount in both directions. If the client has a rotation limitation in the thoracic spine, it is challenging to compensate for in this position. Mobility-related movement compensations should follow NASM’s CEx Continuum, including foam rolling, lengthening techniques, muscle activation, and total body integration. If you or your client do not exhibit optimal results on the above assessments, here is a sample program to get started on the road to better thoracic spine mobility. Thoracic extension—use foam roller to lean back, encouraging reduced flexion. Don’t let the bottom rib flare as that indicates the lumbar spine is beginning to move. You will notice, when performed correctly, there is little movement necessary to obtain a stretch. Perform this as an active stretch: slowly move through the range of motion 8-10 times. Thoracic rotation—this is the same movement used in the assessment. Like above, perform this as an active stretch: slowly move through the range of motion 8-10 times on each side. If the assessment position is uncomfortable for any reason, below is an alternative position. Squeeze a foam roller between the knees to prevent unwanted movement in the hips and pelvis. Thoracic (spinal) extension—in this exercise, concentrate on allowing the motion to occur through the spine. Try to emphasize thoracic flexion over the stability ball and then extend into a neutral position. Move slowly and don’t hyperextend the spine. Perform 12-15 reps. Stability ball combo I—begin with the arms in front, then move to a scaption “Y,” followed by retraction “T,” and then finally depression “A.” Move slowly and keep the spine neutral. Perform 12-15 repetitions, holding each position for 1-2 seconds. Standing wide-grip row—using cable, perform a wide-grip row. A wide-grip row will emphasize the muscles between the shoulder blades and rear deltoids more than the lats. Move slowly and keep the spine neutral. Perform 12-15 repetitions. Overhead squat with tubing—this exercise will attempt to pull the arms and shoulders into extension and the thoracic spine into flexion. The key is to activate the muscles of the shoulders and between the shoulder blades to maintain full shoulder flexion and a neutral thoracic spine (tubing handles are around the arms in this image). Move slowly and keep the spine neutral. Perform 12-15 repetitions.